Bagyong SALOME Update, Forecast, Storm Signals and Track (Nov. 10, 2017) | #SalomePH - Balita Boss! 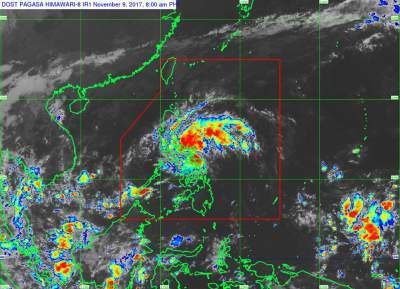 Philippine Atmospheric, Geophysical and Astronomical Services Administration (PAGASA) said on Thursday, November 9, that the low pressure area spotted at East of Catarman, Northern Samar has developed into a tropical depression and was named Bagyong Salome. Here's the weather update on Bagyong SALOME from the state weather bureau. "#SalomePH CONTINUES TO MOVE IN A WEST NORTHWEST DIRECTION AND IS NOW OVER THE WEST PHILIPPINE SEA." According to the weather advisory of PAGASA, issued at 11:00 a.m., Bagyong Salome, at 10:00 a.m., was estimated based on all available data including Subic doppler radar at 175 km West West of Subic, Olongapo (14.9 °N, 118.7 °E) with maximum sustained winds of 65 kph near the center and gustiness of up to 80 kph. For latest updates, kindly check below the Tweets about "#SalomePH".